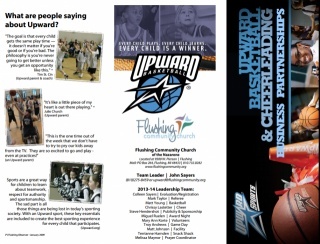 Upward is a world-wide recreational sport organization that has a strong foundation in the Christian faith. Athletes are taught how to play basketball and cheer, but most importantly, they learn how to live their life honoring God. Our coaches teach the sport and they teach some great life lessons while encouraging our athletes to memorize scripture and it's application. We play for about 8 weeks in the January through March time frame each season. Each team plays one game per week and all games take place on Saturday. Teams have only one practice per week. An important time of this practice hour is to pause and sit together as a team to talk about the Life Application lesson for that week. Coaches also award players each week for their effort and play (everyone wins a star for their play every week). 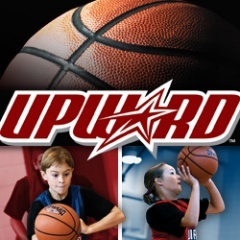 Every child has a great experience at Upward. Whether they are playing basketball or cheering, they walk away from every practice and every game day like they just won a championship! Click to read the attached Sponsorship Information Flier, or contact our office or John Sayers for more information!